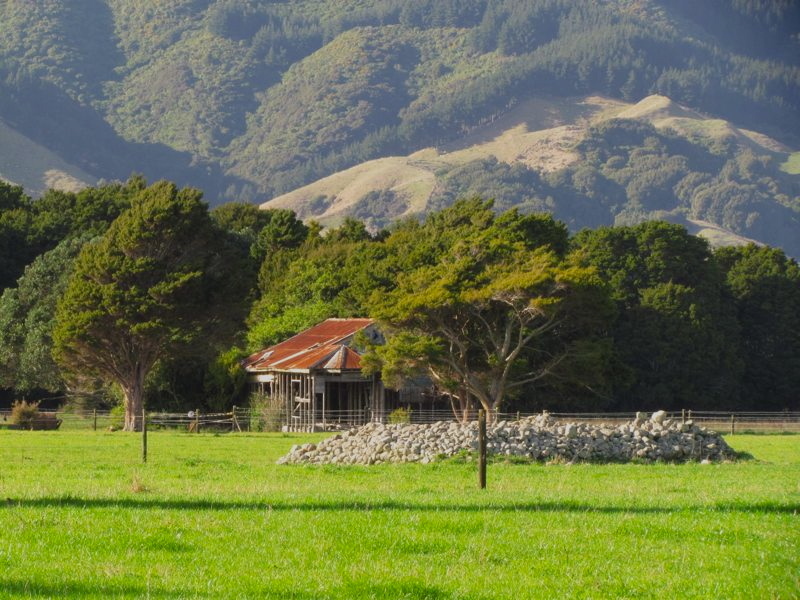 Driving through Te Horo recently, on the Kapiti Coast, I was fascinated by the number of stone walls, stone cairns, and stone piles evident in the locality – more reminiscent of my image of the English countryside, than of typical rural New Zealand. I sensed there must be a story there, and I was not disappointed. The rocks scattered across the flood plains here are greywacke boulders and stones washed down from the Tararuas by the Otaki River. This must have been at times during New Zealand’s geological history when the river ran with tremendous force and carried great volumes of water (or perhaps followed a different course), because the rocks are distributed kilometres from the present course of the river. But how did these rocks and stones end up in orderly walls and piles? The answer lies in the Great Depression. 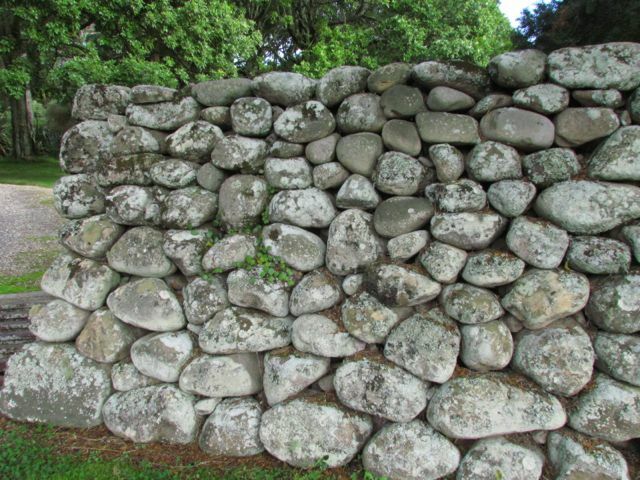 The stones were cleared by bands of unemployed men who worked at Te Horo as part of the Hautere Work Scheme in the early to mid-1930s. At the height of the scheme, 80 men, all housed in tents on Old Hautere Road [click here to view map], worked on stone clearing, for which they received a wage of ten shillings for a six-day week. Eventually, 3000 acres were cleared under the scheme. The farmers were charged per cubic yard of land cleared of stones, or “Hautere turnips”, as they were locally known. The stones, being of greywacke, were too soft for roading or other infrastructural works, though some were subsequently used for sea walls or river groynes. However, most were left where they were stacked or went into soak pits for drainage. But the greatest benefit that the removal of the stones brought was to the land itself, at least from a farmer’s perspective. With their removal, the soils of these flood plains have become a more amenable base for pasture for dairying or horticultural crops, such as berries, olives and vegetatables (though perhaps not turnips). Source/further reading: Changing faces of Te Horo – a record of an exhibition at the Otaki Museum 2009, edited by Jan Harris. Photo top left: A stone wall on Old Hautere Road. Photo: C. Knight. Top centre: A large pile of rocks in a field off Old Hautere Road. The Tararua Ranges are in the background. Photo: C. Knight. 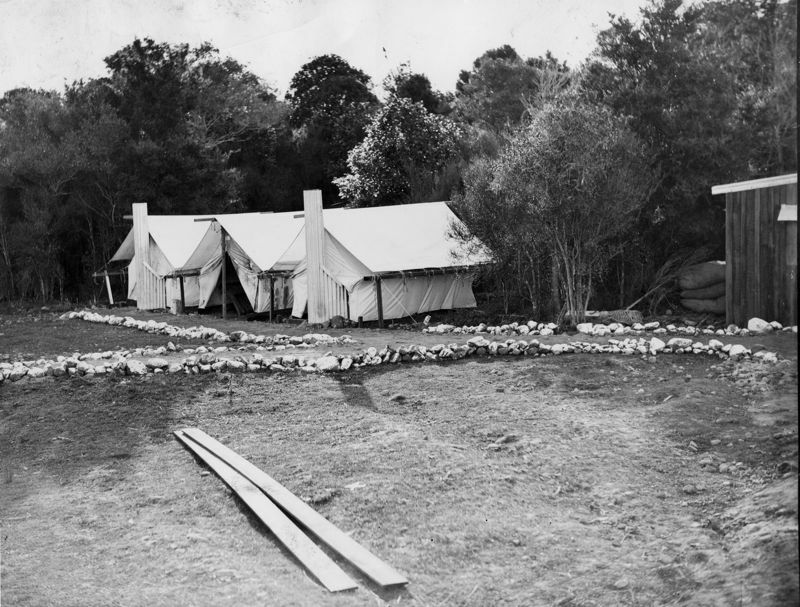 Middle centre: Tents at the labour camp at Te Horo, taken by an unidentified photographer for the Evening Post, circa 1932. Not to be reproduced without permission from Alexander Turnbull Library, ID: PICT-000158. 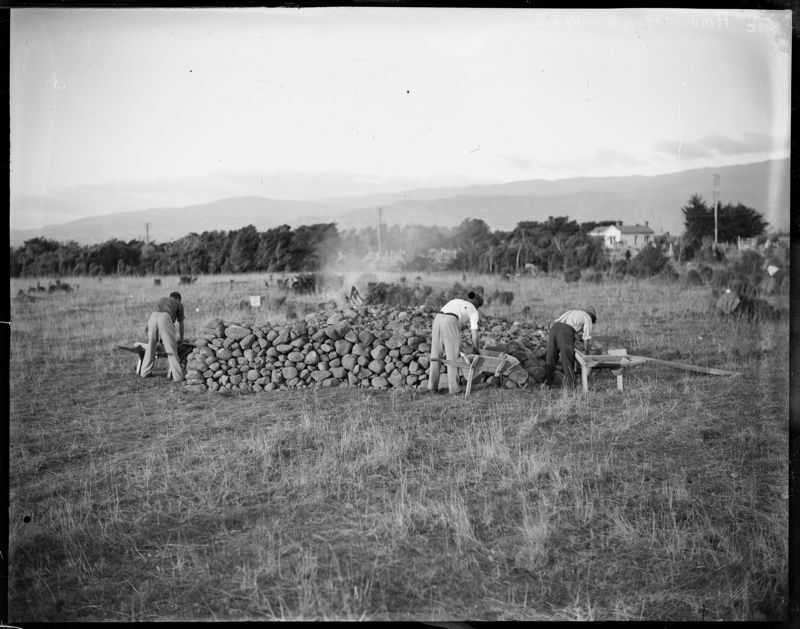 Above centre: Relief workers stacking rocks in a paddock in Te Horo, Kapiti Coast district, Wellington region, circa 5 May 1932, photographed by an unidentified Evening Post staff photographer. Not to be reproduced without permission from Alexander Turnbull Library, ID: 1/2-084201-G. 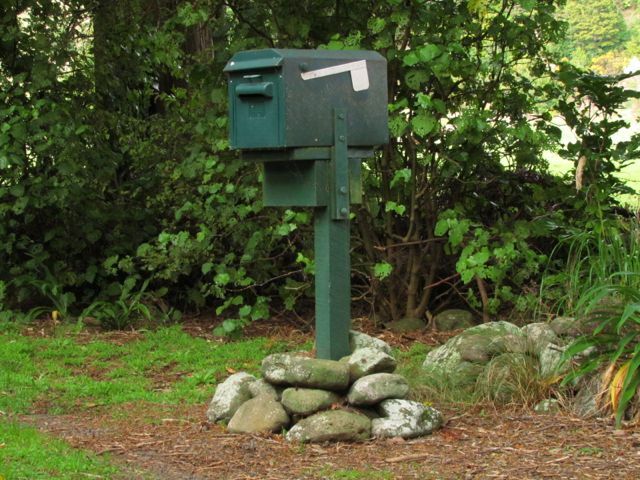 Above right: A letterbox on Otaki Gorge Road. Photo: C. Knight. Another very interesting insight into the past of a familiar place. Could those greywacke rocks have left their own legacy in the soil, mineralising it over millenia and leaving it richer? They make a beautiful wall that has stood the test of 80 years or so! There are stone heaps at Ruapuna, Central Canterbury. http://www.flickr.com/photos/joinash/5869115466/ Here is All Saints Anglican Church built of local stones. You say the stones, ‘being greywacke’ were unsuitable for road metal…however practically all roads in the North Island use crushed greywacke….it is imminently suitable for such use. And the Hautere ‘turnips’ are generally the harder, ie even more suitable…fraction as they have withstood erosion and river transport. However quarrying greywacke in bulk and crushing it is much easier and more convenient a source than using hard round boulders! Thanks Bruce – that’s interesting feedback. I suspect I found this information in “Changing faces of Te Horo – a record of an exhibition at the Otaki Museum” (2009), which I cite as the source for the post. It would be good to check that source again to confirm what it said on this.